A 5ft Dalek held to ransom for more than a week after disappearing in'Somerset turned up on Glastonbury Tor. 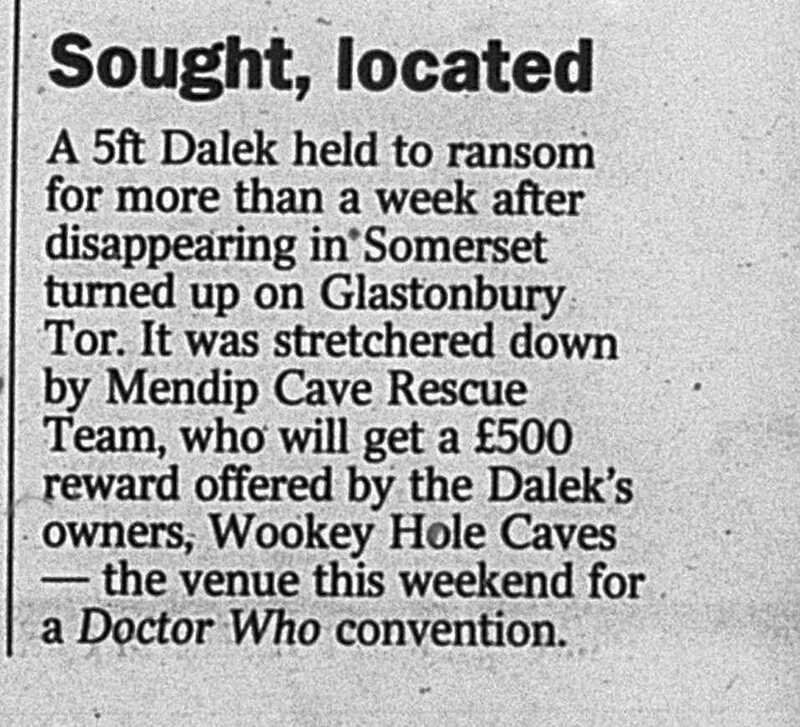 It was stretchered down by Mendip Cave Rescue Team, who will get a £500 reward offered by the Dalek's owners, Wookey Hole Caves — the venue this weekend for a Doctor Who convention. APA 6th ed. : (2005-06-15). Sought, located. The Times p. 8. MLA 7th ed. : "Sought, located." The Times [add city] 2005-06-15, 8. Print. Turabian: "Sought, located." The Times, 2005-06-15, section, 8 edition. This page was last modified on 26 April 2014, at 12:27.